John Steinbeck is 58 and he feels like he’s lost touch with America. He used to know his country, even write books about it, but now he’s unsure. The only sensible thing to do, of course, it to buy a customized truck and set out on a ginormous road trip across America ‘where the people are’ and get to know them all again. I, an American writer, writing about America, was working from memory, and the memory is at best a faulty, warpy reservoir. I had not heard the speech of America, smelled the grass and trees and sewage, seen its hills and water, its color and quality of light. I knew the changes only from books and newspapers. But more than this, I had not felt the country for twenty-five years. In short, I was writing of something I did not know about, and it seems to me that in a so-called writer this is criminal. My memories were distorted by twenty-five intervening years. Parts of the account has been fictionalized in the sense that the words are not as they were spoken or perhaps multiple bits have melted into one coherent story or scene. I don’t think Steinbeck meant to lie, but that he, like most novelists, saw greater truth in the fiction rather than the report. Steinbeck does a great job of capturing the essence of traveling, of that longing to go that some people have. Maybe that’s the appeal of travelogues, it’s the human quest for something, but when we wrap it up in physical destinations it becomes easier to manage. 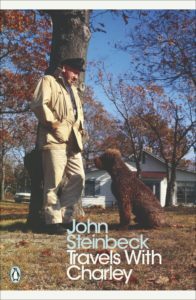 Steinbeck covers a variety of topics, from beautiful scenery to bits of local culture to the nature of waste, destruction and progress. In the south he dives into racial politics and does his best to emerge from it with compassion and dignity. This travelogue reads somewhat calmer than most. Steinbeck travels with his dog Charley for companionship. He is not looking for love or drugs or wild parties, only quiet conversations with the people that he comes across. There’s a bit of drinking, but one gets the sense that most nights are spent looking out on bits of America from the back of his truck. The ending is somewhat abrupt as the trip ends before the journey is over, which is such a physical sensation that Steinbeck manages. He finds his way home. The dog doesn’t die. But there are no answers. It is a classic ‘there and back again’ tale, but the gold doesn’t just belong to Steinbeck, it belongs to all of us. Now excuse me as I go buy a dog and roadtrip across the world.